Forever ethereal and sparkling with light, Yabadoo brings enchantment and delight to whatever event you have planned. 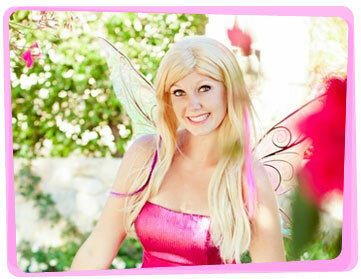 If you want to hire a fairy for a kids party, we’ve got the most entertaining fairies for hire in Canberra. Our Fairies for hire will entertain the kids with an interactive magic show filled with storytelling, spells, magic and laughter. They’ll also provide the children with great themed party ideas including balloon modelling, temporary tattoos, a treasure hunt, face painting, magical fairy party games (including pass the parcel) and lots more. Once you hire a Yabadoo fairy in Canberra, your birthday girl will receive an enormous pair of balloon wings and a balloon wand during the magic show. 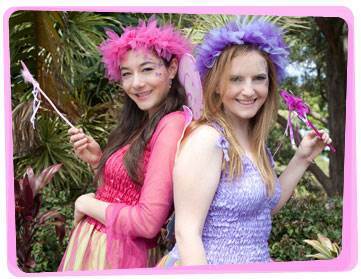 No matter what type of event you’re holding, our party fairies in Canberra are here to help! We’ve loved performing at children’s birthday parties and a variety of other occasions over the last two decades. 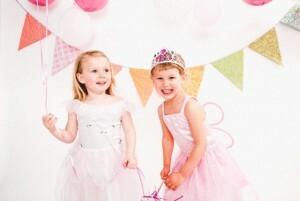 Need some fairy party game ideas whilst your entertainer is still arriving? You will need a bunch of fairy kids with wands and one brave adult to volunteer as the dwarf. The dwarf runs around as the fairies try to tag and tap him using their wand. Each time the dwarf is tagged, he stops running and throws a bunch of candies and chocolates in the air as an indication of getting freed from the spell. The fairies get to keep the goodies they catch or take from the ground. You can have as many rounds as you’d like! 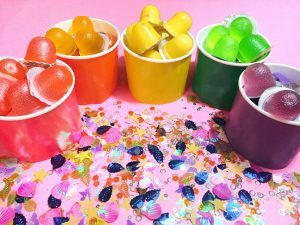 All you need to do is to put the candies in a container whose color matches the candies. If you’re using fruits, put the strawberries in the red container, the oranges in an orange container, and so on. Line them up like the colors of the rainbow. Can’t find containers that has rainbow colors? Cover it with art paper with your color of choice, like what we did in the photo above!